An ultimate foodies guide to some of the best food in Riga, Latvia. Whether you’re looking to eat on a budget or go all out, Riga has some of the best restaurants and markets I’ve ever seen and eaten at, and some of the best produce I’ve come across in my travels. 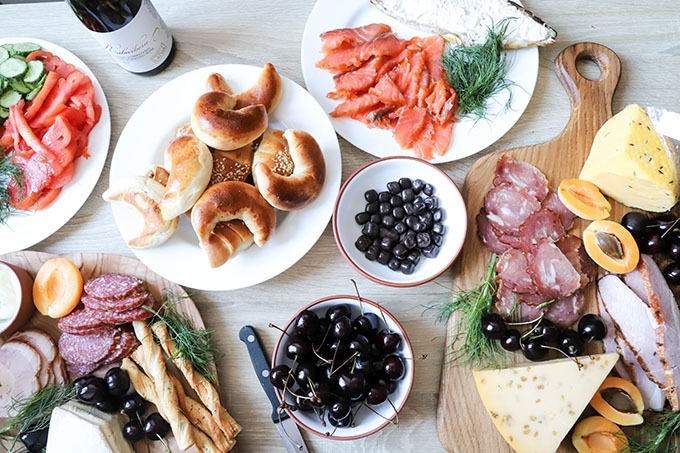 Included in this post, is my top restaurants and cafes, AND a beautiful Latvian style charcuterie board that you can make in your own hotel room, using produce from the Central Market! If you know me, then you know I absolutely love to travel. Since my teenage years, I’ve been to at least 17 different countries across 5 continents and have no plans to stop there. When I was younger, my travel plans used to focus a lot on two things – shopping and sightseeing (I’m looking at you London and Paris). When I was a little older, it was shopping and partying (hello Thailand!). Then the older I was, the more it centred around shopping and cultural experiences (oh hi India and Kenya!). Now though, as I approach my late 20s, my travel tends to be focused on one thing – FOOD (ok fine, and shopping, and cultural experiences!). The older I get, the more I seem to plan my vacations around the best places to eat, and countries where I want to learn more about the food. I’ve come to realise, that learning about food in other countries, and the experiences you centre around food, can definitely be a defining part of your travels. While we may not speak the same language, I believe that food is a universal language that everyone speaks. Everywhere you go, there is some central place that people gather to eat. Whether it’s the food markets in Marrakesh, the tiny bars and pubs in London, the side streets in India where families gather for dinner, or the tiny taco place in Mexico where all the locals hang out, food is everywhere, and it brings people together. Everywhere we travel, we make it a mission to seek out the best food in that area, and new dining experiences that we can share together. We’ve come to see that these dining experiences may be way out there, fancy and expensive (like that time we accidentally went to a Michelin star restaurant in New York), or they can be as simple as finding the best taco’s you’ve ever eaten in your life through the knowledge of an Air BnB host who pointed out the place where all the locals go. Some of my best travel experiences have been centred around food, and I’d love to share these unique experiences with you guys! Long story short, Adam has family in Riga, which is why we ended up there on vacation a few weeks ago. We met up with his parents, our brother and sister in law and their baby, and our sister in law’s parents, and spent 10 days wandering the streets of Riga, and experiencing the 100th year anniversary of the Latvian Song and Dance festival. If you’ve never been, Latvians are extremely proud of their history and culture and have the most beautiful national costumes. Generally, everyone either sings, dances of plays in a band, and it’s not uncommon to hear a group break out in song on the streets or on the trams. Not only do the Latvians have some amazing, high-quality food, but OMG their handcrafts are incredible as well! We bought two absolutely gorgeous servings platters in the markets, and three beautiful terracotta and white glazed servings bowls (no doubt you’ll see them pop up on THCK in the future!). They also have superb leather goods, and beautiful hand-woven woollen goods as well, but enough about that, onto the food. The first thing you’ll notice is that a lot of Latvian food has dill in it. If you’re not a dill fan, you’ll probably be by the time to leave Latvia, because you can’t escape it! Dill is in everything – salads, soup, potatoes, fish, and anything else that you can find. As well as dill, Latvians love to eat fish, and I have never eaten so much smoked fish in my life (not complaining!). What I found about the food in Riga, was that everything was fresh. Not only was it fresh, but such high-quality too. You can definitely taste the difference between a Latvian grown tomato bought from the markets, compared to a regular tomato bought in an American supermarket. There is just something about the quality that is so noticeable. I also discovered that Latvians eat really, really healthily. Dinners usually consisted of some form of smoked meats or fish, and some fresh tomatoes and dill, or big fresh salads and fish. Every meal came with vegetables or salad, a big difference compared to the meals you get here in the US. Even if you’re eating a bistro-style meal, there were always vegetables, and always potatoes! Eating out in restaurants can very cheap depending on where you go. I remember paying 12 Euro ($14USD) for Adam and me to eat at a restaurant, which included beers and dessert. Eating out can also be very expensive if you’re looking for a finer dining experience. In saying that, I think the most we paid for a meal was around $115 USD for a meal at one of the top restaurants in Riga. Depending on your budget, there are many options! Hands down, the best breakfast we ate was at the Rocket Bean Cafe. We loved it so much, we went back twice! The Rocket Bean Cafe is a tram ride away, out of the old town into the new town on Miera iela (street). We went for a weekday brunch, and weekend breakfast. The employees all spoke excellent English, and the coffee was extraordinary. Coming from Melbourne, and being a self-proclaimed coffee snob, it was the best coffee I’ve had outside of Australia! Their brunch was a buffet-style brunch, and they had a fully loaded table of salads, cheeses, meats, smoked fish, mini sausages, hard boiled eggs, granola and loads more. The weekday price was slightly cheaper than the weekend price, but the weekend brunch table was loaded with a lot more food! If you’re going on a weekend though, I would suggest booking because it get’s really busy, really quickly. As an added bonus, if you catch the Tram (#11), up to Rocket Bean Cafe, you can cross the road to the Laima Chocolate Museum. Being a kid at heart, the Laima chocolate museum was so much fun! 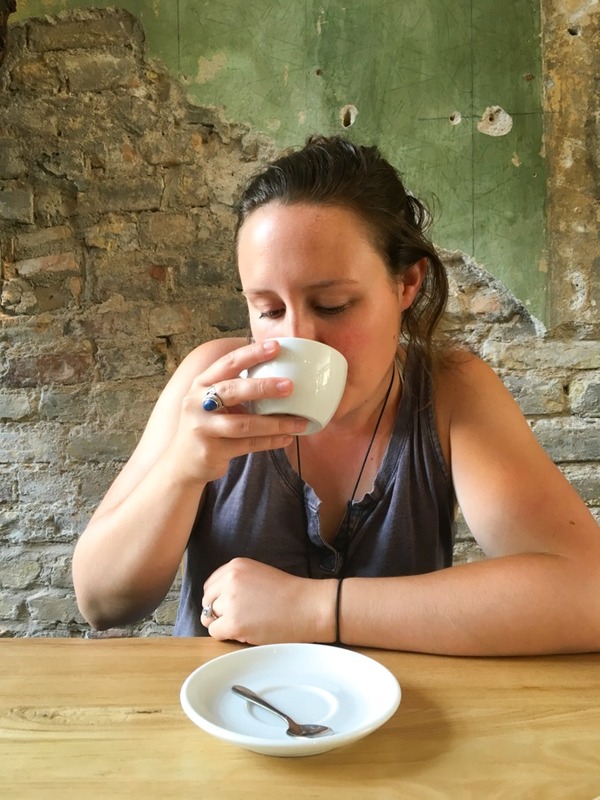 If you’re searching for good coffee in Old Riga, we loved Kuuka Kafe. Just around the corner from St. Peters Church of Riga, Kuuka had excellent coffee and decent prices. It may be on the higher side of prices (around 3 Euro for a flat white), but it was the best coffee we found in Old Riga, second to Rocket. From memory, we didn’t really eat breakfast out, apart from going to Rocket. 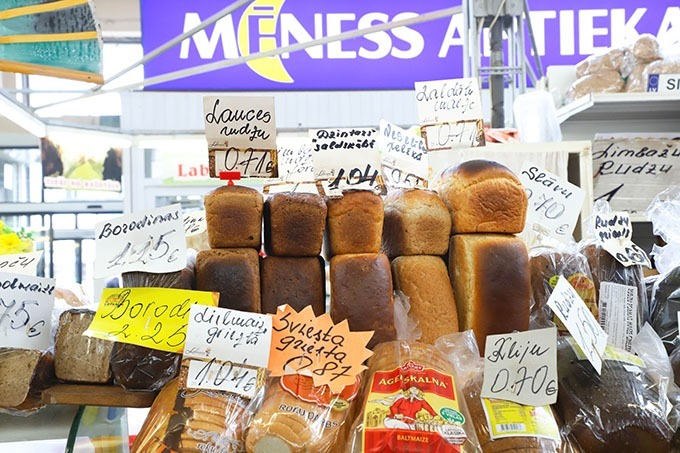 We found it to be more affordable to get some basic staples from the Riga Central Market and make our own breakfast at home. A staple breakfast for us was dark rye bread, topped with fresh tomato, dill and some smoked fish or salami. We typically ate fairly late when it came to lunch and dinner. As the sun never really set until 11pm, many people were still out and about rather late, and many restaurants were still open past 10pm. I’m not sure if that is the same in the winter time, but summertime was definitely busier at night. For a more affordable, Latvian style restaurant, Lido was a great option, especially for us travelling with a large party and a small child. The Lido is a buffet style set up, where you pay the price per piece of food. So for example, a pile of potatoes would be 1.5o Euro, a piece of grilled chicken 1 Euro etc. They had a really great range of food, mainly a lot of salads, piles of potatoes, grilled chicken and fresh fish. They also had some beautiful desserts! A meal here cost both of us around $14USD (with beer and dessert!). Around Old Town, we also ventured to Easy Beer, which had a variety of beers on tap and some great burgers. We also went to Ogle Wood Fired Grill for pizza which was really great and relatively affordable. There are plenty of other affordable restaurants if you do a simple search for ‘restaurants’ in Google Maps too. Google Maps tends to provide reviews of each restaurant as well. As a general rule, we tend to not go to places lower than a 4 or 4.5! Another place I loved and wished I’d gone back to dinner for, was FolkKlubs Ala Pagrabs. This restaurant is super cool, established in an old basement in Old Town Riga. The food was mostly traditional Latvian, and they had a huge selection of beers and ciders on tap. The food was absolutely delicious and apparently, they do live music most nights too! We only went for lunch, but I definitely would have gone back more than once! While we were in Riga, we also wanted to go to some of the higher end restaurants to see what they were like. There are three ones that were on our list – Biblioteka No 1, Muusu and Restorans No 3. All three restaurants are highly acclaimed in Riga, and I do believe Biblioteka and Restorans No. 3 is owned by the same people. In the end, we went with Restorans No.3. Restorans No.3 was certainly surprising, but I must say I had total meal envy. I ordered the scallop and crab which came with foie gras. I wasn’t a huge fan of the foie gras, not sure if it was because I knew how it was made, or if it was because of the texture, but the rest of the meal was really nice. Adam had this beautiful venison dish which was so, SO good, I kinda wished I had ordered that myself! We did also get this beautiful ‘forest platter’ made up from local cheeses and meats which was absolutely stunning and so delicious! I’d definitely love to check out the other two restaurants if we ever go back! I enjoyed Restorans No. 3, but I think the food was just a bit much, a bit rich and just a little too different for my taste buds. It was a really unique dining experience though, which is something I appreciated. Melna Bite was also up there on our list of places that we loved. Serving some traditional Latvian foods, this was a farm to table style restaurant, serving up fresh local foods. I think the most amazing part of the dinner was the desserts. I tried a sour cream panna cotta that was absolutely stunning, and Adam had this really interested traditional rye cake sponge trifle type thing! I can’t find the dessert menu, but I remember it being really, really unique! Almost like a gingerbread cake! We didn’t really go out much for drinks, considering we were eating dinner so late, but I’d definitely recommend Hedgehog in the Fog, for it’s really cool, hip young hipster vibe and super cheap beers! The music was great too. We have also heard that Pagalms is meant to be really good for drinks and dinner. These are only a handful of places that we went to and would recommend, there are so many other places that I’m sure are fantastic! Without a doubt, the Riga Central Market was the best food market I’ve ever been to! The quality of produce was absolutely amazing and so SO cheap! 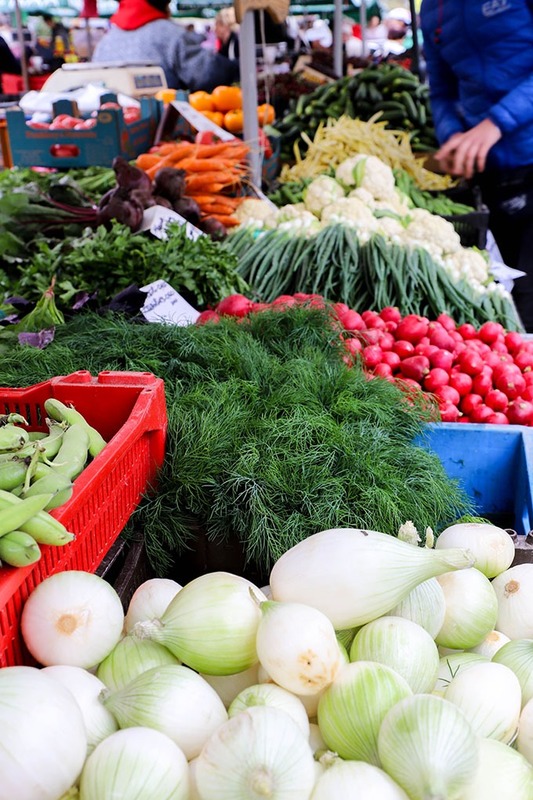 If you’re on a budget, then definitely visit the market to pick out some goodies for breakfast and dinners. 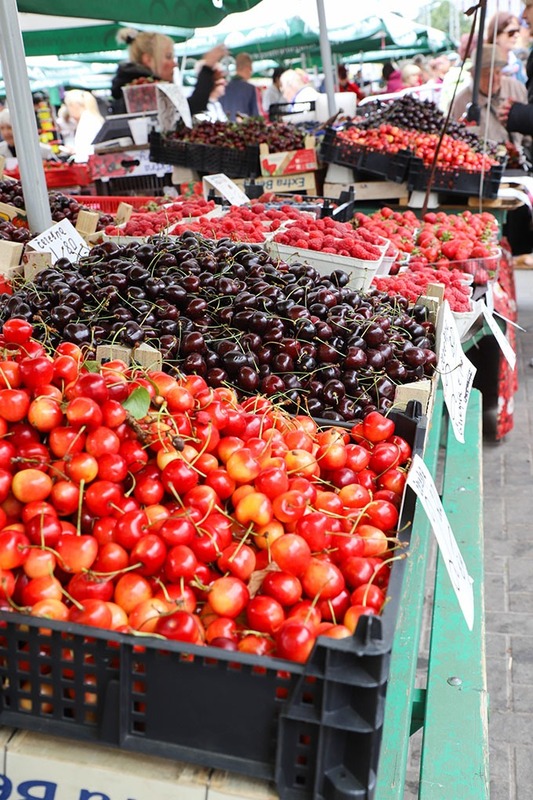 The market is actually the biggest market in Europe and spans across three massive buildings plus the outside streets. A lot of the food sold at the market was cultivated in Latvia, however, a lot of it came from neighbouring countries as well. Most places will write where their food comes from, and in the interest of keeping thing local, we tried to only shop at the stalls that had Latvian produce. As well as fresh food, meat and fish, the Central Market has some beautiful bakeries, coffee shops, Latvian handcrafts and live music! We were lucky enough to have Adam’s Mum, who speaks Latvian, and her cousin come along with us to help us pick out some food for our Latvian style charcuterie board. It definitely helped to have someone with local knowledge of the market and vendors, but we found generally most people speak English. And when in doubt, pointing and writing down quantities in a calculator definitely helps! We made this epic charcuterie board for our family and friends, which included 8 adults. If you’re on a budget or want a night in, I would highly recommend hitting up the markets and picking up some fresh produce to make your own board in your hotel room. We were lucky that we had a small kitchen in our apartment, and I picked up two serving platters and some serving bowls earlier that day to take home! When it came to this particular Latvian charcuterie board, I wanted a combination of meats, cheese, smoked fish and fresh foods. We also wanted to keep things as traditional as possible. We opted for four different types of meats. We got two different types of salami, and two different types of stuffed ham. We found in a lot of places, they didn’t do slices, meaning you had to buy them in bulk. In saying that though, one of our massive pieces of salami cost us only 3 Euro. People were always very kind and willing to let us try the meats before we bought them. As I mentioned before, a lot of people speak English which is really useful when you’re trying to order foods you may not know! One of our family members is allergic to fish, so we only had a couple that we kept away from the board. I couldn’t go past the smoked salmon, which we got for 7 Euro. It was so beautiful and lasted us a few days after that. We also bought a smoked mackerel. Mackerel is a popular fish in Latvia. This particular fish had mayonnaise and dill in the middle of it. While it was good, it probably wasn’t as good as the salmon. 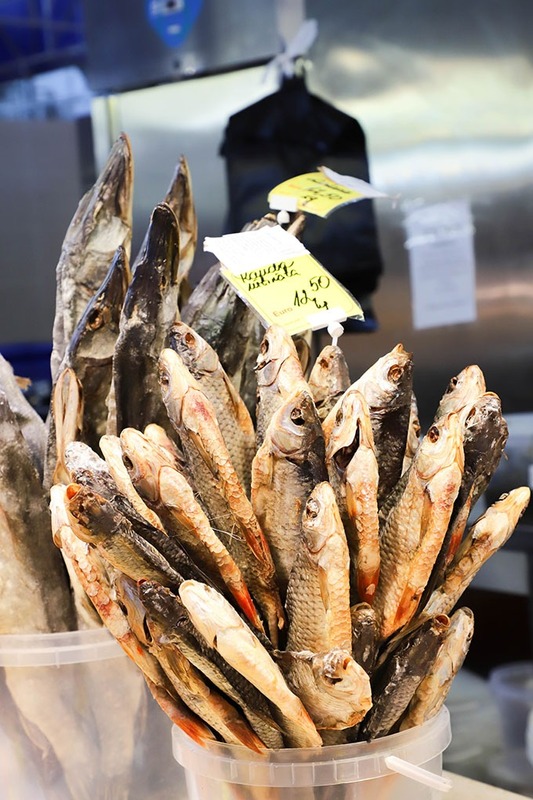 Sprats are also widely eaten in Latvian, they’re little sardines and you can buy them in tins. Tinned sprats were kind of our back up option is we ran out of food! For this particular charcuterie board, we went for three kinds of cheese. One was just a regular old brie, and the other two were more Latvian style. One was a Latvian cheese that is eaten on Midsummers Eve. I can’t recall the name, but it had a lot of caraway in it. Spoiler alert – don’t buy it unless you fry it! It wasn’t overly good to eat with crackers or by itself, but we tried it fried and it tasted a little better! The other one was a clover cheese that was so subtle in flavour and absolutely delicious. With cheeses, always see if you can taste them before you buy them. This was a valuable lesson we learnt! As well as the meats, fish and cheese we wanted to get some produce to kind of ‘fill in’ our boards. The obvious choice firstly was fresh fruit. 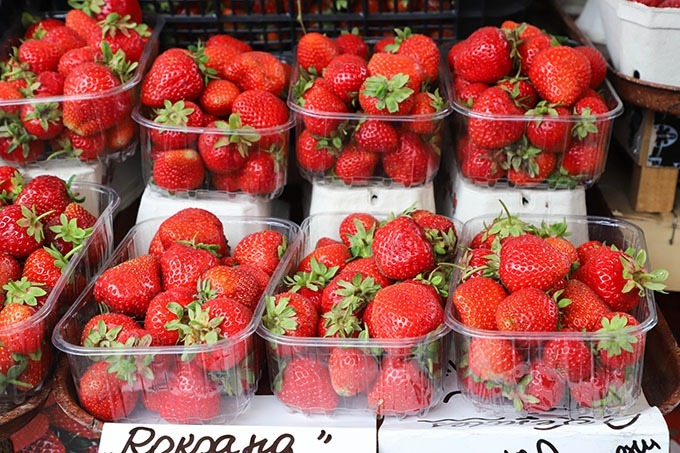 The berry season was in full force in Riga, and the selection of fresh blueberries, raspberries, strawberries and cherries was amazing! We had fresh cherries, and apricots as part of our board, and the fruit paired beautifully with the meat and cheese. Worried that people were going to get hungry, we added some dark rye bread, fresh tomato, mayonnaise, and you guess it – dill. This gave people the option of having more than just some meat, cheese and crackers and it was gone in a second. A Latvian feast wouldn’t be complete without Piragi. Piragi is a traditional Latvian bread filled with meat, shaped into a crescent-like shape. These are very popular in different forms around Russia and Poland, and other Baltic countries too. 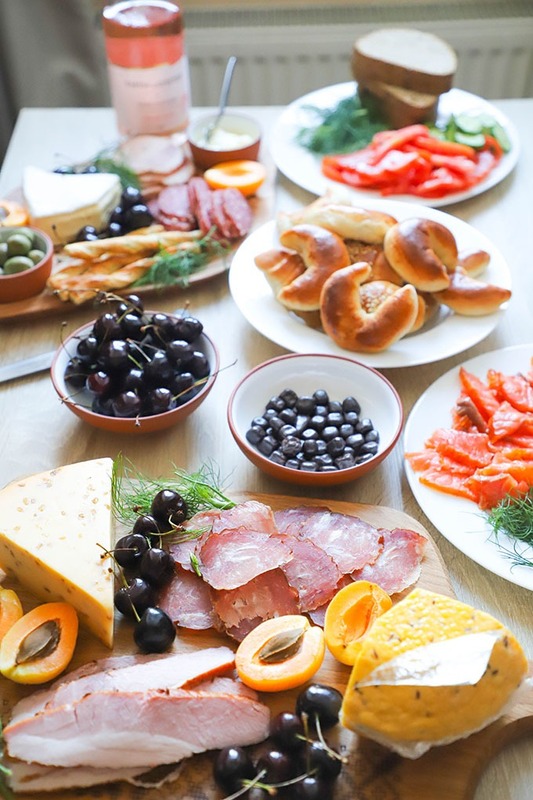 Piragi’s are an absolute must-have when it comes to making your own charcuterie board, or anytime you really need a small snack! They are absolutely delicious! To finish everything up, we had a bowl of Laima chocolate coated raspberries! Laima is the chocolate factory that was established in the 1800s in Riga. Some of the best chocolate I’ve ever eaten came from Laima, and these chocolate coated raspberries were so good, they were gone in minutes! 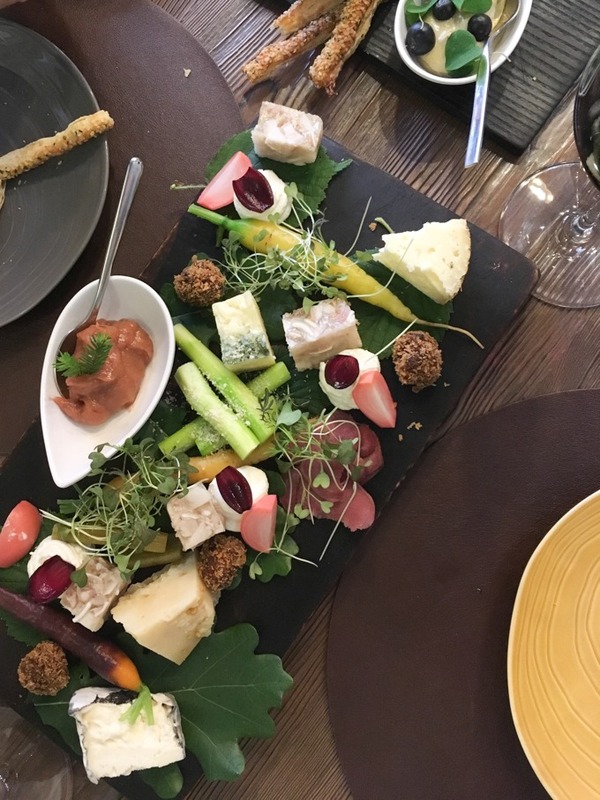 Latvia was certainly a place of unique food experiences, and we had some of the best food in Riga that we’ve ever eaten! Whether you’re on a budget, or can afford to branch out a little, there are so many options and choices for good food and coffee! If I can’t say it enough, I’d highly recommend a visit to the Central Market, so that you can whip up your own Latvian charcuterie board! It’s the best way to experiences local foods and probably one of the most budget-friendly ways to eat in Riga! Want to know more about the food in Riga? Drop a comment below, or ask any questions you may have about Riga or Latvia! I’d love to answer them! If you loved this recipe, I’d love for you to leave a comment and review! Also, don’t forget to snap a pic of your finished recipe and share it on our on our Instagram account using the hashtag #thehomecookskitchen or tagging me @thehomecookskitchen. I’d love to see your creations! *I know that some of the images aren’t super bright, but when we are out for dinner, we tend not to take our good camera and just use our iPhones! Less of a distraction!